Glen Dooley Antiques – WHAT IS JAMES WEARING? I recently dropped in to congratulate my friend Glen Dooley on his brilliant new antiques gallery. I’m quite pleased to have this fabulous resource to turn to for a super sophisticated mix of styles and periods. Dooley was born in Nottingham, England, but knew that destiny awaited him in New York City. Along the way he collected all kinds of things from stamps to go-go boots, and then turned his passion to antiques. Dooley has worked at some of the most esteemed antiques galleries in New York City, and fortunately for us, we can now benefit from a collection assembled exclusively by him. Well done! 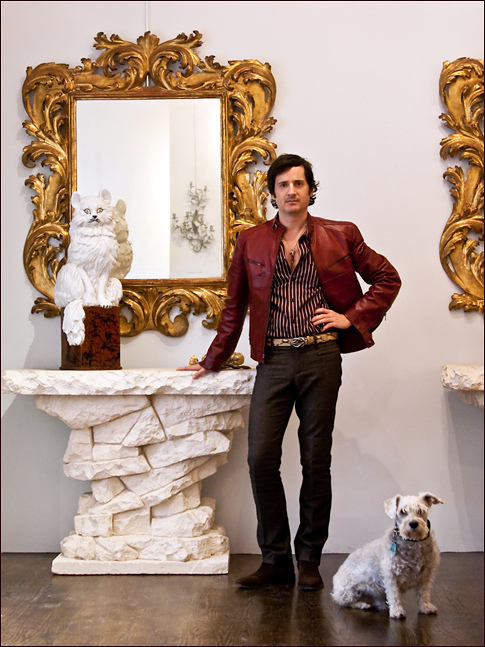 I love the work of Emilio Terry, and so I’m fainting over this pair of Terry-esque rock face consoles (California c. 1970’s) – The grand pair of gilt mirrors are Italian baroque – The splendid cat (once used to scare off birds!) is French early 20th century, and then there is the priceless “Jack” at my feet – sorry, not for sale! I’m wearing a red leather biker jacket, brown, red and white striped cotton shirt with band collar, brown wool tweed motorcycle pants, python belt with silver buckle and brown suede cap toe shoes all by Gucci. Another brilliant photo by the very talented Lars Stephan!